When? Four nights at the end of September (September 27 – October 1). Where? We selected Hotel Sol as our home base for the four nights, and I’m glad we did! The other two places we were looking at were El Albergue, which is located right next to the train station, therefore it’s about a 10 minutes walk up to town, and Casa de Wow! El Abergue didn’t have the type of room we wanted available (and I wasn’t completely sold on staying away from the main town center) and Casa de Wow was sold out. Ryan will provide more detail about Hotel Sol, but as a summary: we paid $85/night, which allowed us a spacious room on the first floor with a terrace. This also included breakfast (and even a boxed breakfast for the morning we left for Machu Picchu at 4:30 a.m.). Transportation. We flew from Lima to Cusco and then took taxis (arranged by the hotel) to and from the airport (almost a two hour drive). We took the train to Machu Picchu and hired a driver for our day trip to the Pisac ruins. Food. 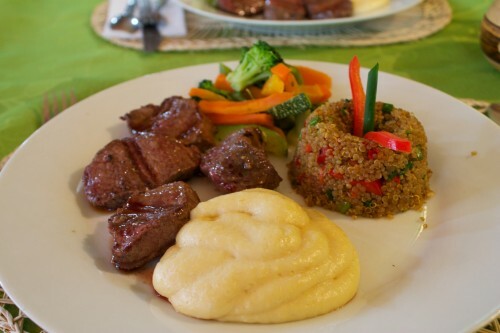 The typical Andean cuisine can be found here. The three biggies are trout, alpaca (pictured below), and guinea pig, and between the two of us, we tried them all! Day Trips. We took two – one to Machu Picchu, which was planned in advance, and one to the ruins at Pisac which was planned the day before (but discussed prior to the trip). There are some other great options nearby – Moray and the salt mines at Maras. We had originally planned to visit both of those and Pisac on the same day, but I’m so glad we stuck with a half day instead, which was already very exhausting. Attractions. 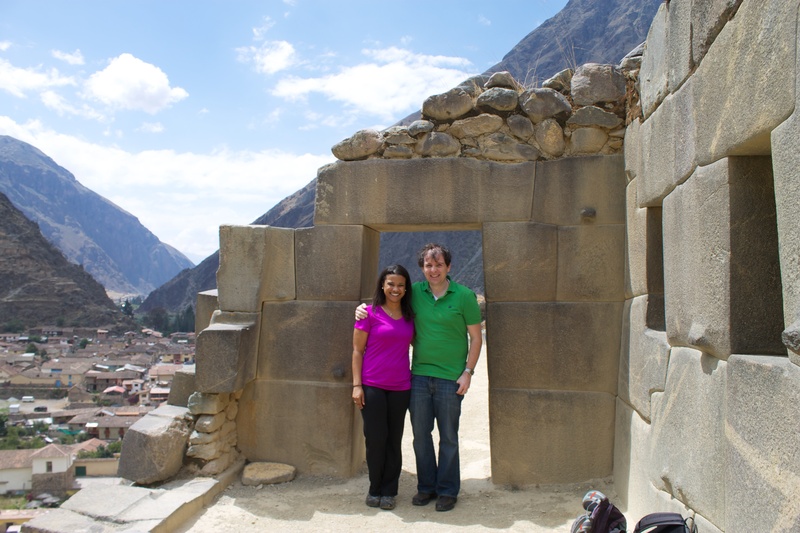 The major attraction in the town of Ollantaytambo is the Fortress (a picture of us at the Fortress is below). There is no information inside, so either a guidebook or a guide is highly recommended (we went with a guide, since neither of the guidebooks had any real information on it). The town also has other hikes nearby and we did one of them – Pinkullyuna. Language Barrier. We did not brush up on our Spanish before leaving, but we know the (very) basics. Our guide spoke English, and we were maybe able to understand about 60-70% of what he said. We had no issues at the hotel or restaurants. Advice. Ollantaytambo was very much a “cash town” (some of the restaurants did accept credit cards, though, as did our hotel). There are two ATMs in town (only one worked), but the big issue was keeping enough of the smaller (less than 50 soles) bills and coins. If you get them, hold on to them! They will be needed for tips and small purchases (water, souvenirs, etc. ), and we were even hounded for a 10 sol bill for the purchase of our 260-soles activity boletos. Closing Comments. If you have the time, plan to stay in one of the smaller towns in the Sacred Valley, instead of spending all of your time in Cusco. 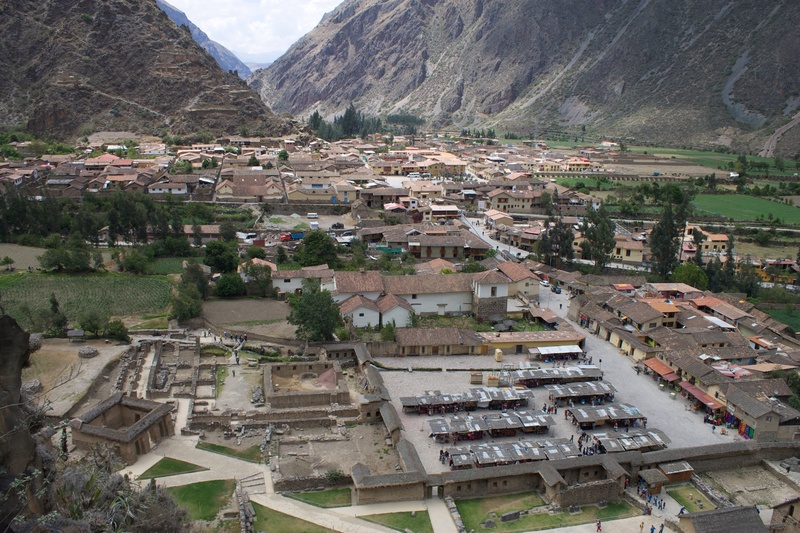 We were very happy with our choice of Ollantaytambo, which was small and welcoming, but also offered plenty of restaurants, shops, and nearby attractions to keep us busy. This entry was posted in City Overview, Travel by Kristin. Bookmark the permalink.